Sub : Re-imbursement of Mobile charges to non-entitled officers Sr.AOs/AOs/AAOs posted in SPMUs. The undersigned is directed to convey the approval of Controller General of Accounts vide diary no. 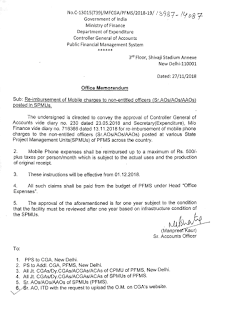 230 dated 23.05.2018 and Secretary (Expenditure), M/o Finance vide diary no. 716366 dated 13.11.2018 for re-imbursement of mobile phone charges to the non-entitled officers (Sr.AOs/AOs/AAOs) posted at various State Project Management Units(SPMUs) of PFMS across the country. 4. All such claims shall be paid from the budget of PFMS under Head “Office Expenses”.